Runs large, however it’s beautiful looks very clean and elegant on the bed. Enhance and improve your bedroom decor with the all new Merit Linens double-brushed 3-Piece duvet cover set- Does Not Include Comforter. Tailored for a perfect fit and made with the finest imported microfiber yarns for ultimate comfort. This luxury duvet cover set is expertly stitched for durability to last a lifetime and raises the bar for coziness and elegance. Includes two matching pillow shams to bring elegance to any bedroom! I read the reviews and was right in ordering the Full/Queen for my King size comforter. This product definitely runs large. The quality is good for the price. The fabric is very soft and after a washing/drying I did not have to iron. There was a slight rip in the seam, but I can repair on my own. I am satisfied with this purchase, I also bought the Eddie Bauer 600 Fill Power white down medium warmth comforter with this duvet. I ordered King size for both. The duvet was easy to put over the comforter, the zipper feature is nice and easy. The duvet is very soft, doesn't wrinkle when washed and very pretty. The only downside that I have is that the duvet cover is slightly big, there is a little extra fabric...having said that I am still extremely happy with the purchase. I ordered this duvet cover for my dorm room, and am so glad that I opened it at home where laundry is free, because I have had to wash this four times so far to try to get rid of the awful sulfur and rotten scent that came with it. It is as beautiful as it looks in the pictures, yes, but the scent is repulsive. I bought Downy scent refresher things for the wash to try to fix it, and have used almost half the bottle (plus a full cap of fabric softener every time, as it was so stiff). I hope this smell comes out, because I love the design, but I am very disappointed in the quality of the product in its stiffness and odor. 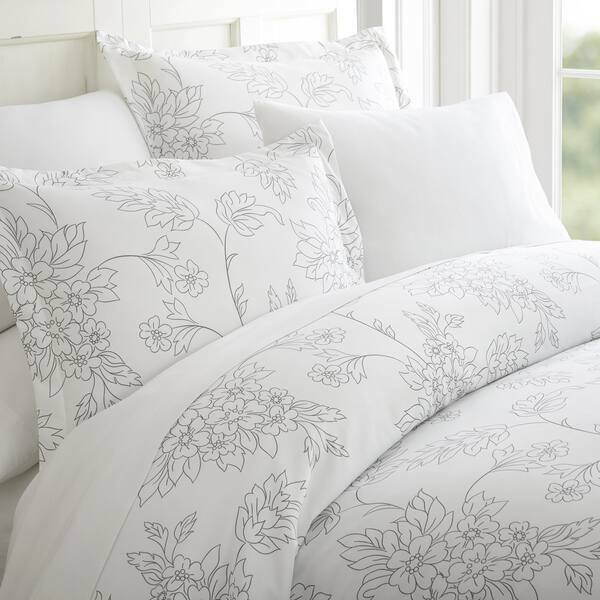 This is a soft and pretty duvet cover with shams. The instructions say not to iron, so I washed & tumble dried on low, but the wrinkles and ceases (from being folded & rolled for shipping) didn’t go away at all. Listen to the reviews about the size—I ordered the full/queen size and the cover is still a little too roomy for my king comforter. For the price, it’s nice, although the creases and wrinkles bother me a lot. I’ll probably iron it inside out and hope for the best. I am very happy with this set. I found it just as described. Many comments were complaining or confused. The description--if you would just read it--explains that each dual-size duvet covers 2 similar sized beds, so if yours is the smaller of those 2, then it will seem a little big. I may shorten mine after washing it. That will take 5 minutes. Twin covers always have only one pillow case. Microfiber is by nature very lightweight. If you have pets or whatever on your bed, select a heavier fabric. The duvet set looks exactly like the picture. The beautiful pattern in soft grey color brightens my bedroom. I like the material of the fabric which is soft and breathable. I purchased 2 of these duvet sets in different colors and patterns. I am so happy for the purchase! I love my duvet cover and shams. The cover fits my comforter well and has a nice zippered closure. This duvet cover is the perfect size. I love the zipper closure. for the first time since I've been buying duvet covers. I did not have to struggle to put it on my comforter without any help! It feels soft and looks beautiful with the vine pattern. Comforter fits perfect and does not shift around. I recommend this duvet cover highly. HORRIBLE SMELL!!! LIKE A SKUNK! I'm on the second wash for this duvet cover,which is very pretty but when opened it had the most HORRIBLE smell,like a skunk had spayed it and then washed,it just lingers! Yuck! If it doesn't subside after this wash,it's going back. I purchased this when I got my comforter. No smell! Just wonderfully soft fabric. Perfect fir our cooler temps. Highly recommend. I was so excited to get this in the mail, I literally counted down the days because I had been wanting a new one so bad. When I opened it up, it smelled like curry. It smelled absolutely horrible. I washed it two times and the scent still hasn't come out and I want my money back. Please do yourself a favor and DO NOT GET THIS!!!!!!!!!!!! Unless you enjoy the intense smell of the inside of an Indian restaurant that is. I just love this cover. I love the delicate pattern I have chosen. Its so soft and pretty. Love the soft cotton fabric and how easy it slid onto my comforter. I would so tell every on to shop here if looking for this item. I am so happy with all my puchases today. I will certanily be a return customer. Jody W.
Just beautiful. I love the pattern. Soft it’s everything I wanted and more. I do like this set. The pattern is beautiful. The material is kind of like microfiber. It is soft and better for the winter as it is pretty warm. I do like this set. I love this duvet cover set! I've had it a few months now and it is so soft and comfy. The pattern is subtle and beautiful! It also comes out of the dryer looking great without wrinkles. I love it so much I bought another one in a different pattern! Exactly what I expected, the photos are accurate. I obviously can't exactly describe the softness, but "Ultra-soft" from the product description does the trick. I love the colors, so pretty, I had a hard time getting it on, but I do like it. just wish it was easier to put over comforter. DON'T BUY THESE SHEETS! I bought another pair and loved them. So soft and the pattern was lovely so I bought some for all of the beds in the house. Stupid me. I should have waited until I'd washed them a couple of times. They pill. Those disgusting pills that cheap sheets get after you wash them. And of course, the return period is over so I'm stuck with not 1, not 2, not 3 but 4 pairs of crap sheets. I will never buy from this company again! Definitely an oversized duvet cover--soft and has the ties. You can barely see the print, but that's okay. "What's going on with the bad smell from this comforter"
I ordered this duvet , queen size. No bad odor whatsoever. Size is a little large but ok with me. Love the design....cheerful print. No bad odor for the king set received and my family is very intolerant of smells - going down the detergent aisle at grocery is like a swat team exercise - run down, grab product and get out. HOWEVER, these questions about smell are from 2017, perhaps new manufacturing has addressed this for more current orders. "Is the Aqua on the pale green side or the blue? Sea foam green or Aqua blue?" It is def more of a sea foam green. The color is very faint and might be more aqua than blue. It appears generally WHITE from a distance. The fabric is very nice and soft. "What is the size, DIMENSIONS, OF THE QUEEN SIZE...?? I want the spread to GO ALL THE WAY TO THE FLOOR, FROM ALL 3 sides...!!! It IF YOU CAN. will you please give dime tips of the QUEEN AND THE KING SUZE... WHY CANT YOU PRINT DIMENTIONS OF ALL QUILTS, SO THAT PEOPLE DONT HAVE TO SEND THINGS BACK... I want to order and put on bed immediately, shopping back defeats the purpose of you have to PAY A TON, TO SEND IT BACK, WHICH IS ALSO A PAIN...!!! PLEASE RESPOND...!! !💥"
"Is the printed pattern on both sides or only one? i.e. is there a solid white side?" No a zipper, very easy to get your comforter in. "Is the grey for the vine print or the background color"
It is the vine print. "Many purchasers are saying this runs big. Could I get the actual dimensions for the King size for someone who purchased the item?"